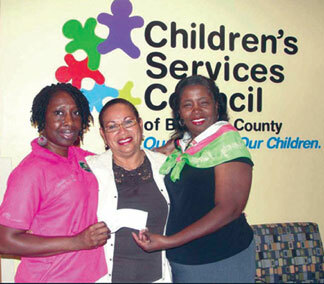 Chi Psi Omega Chapter of Alpha Kappa Alpha Sorority, Incorporated members presented a check to Sandra Bernard-Bastien, director of Public Affairs and Organizational Development for Children Services Council. The check in the amount of $1000 was donated through the chapter‘s charitable arm, A Plus Foundation, Inc., as a result of a request letter from Children’s Services Council for gift cards to be provided for needy children to be prepared and school ready for this worthy cause and worthwhile investment. Moreover, the chapter, through its charitable arm, A Plus Foundation, Incorporated, is committed to making a difference through its ongoing programs for children; implementing its International President’s Signature Program: Emerging Young Leaders (EYL-preparing young ladies in grades 6-8 to be leaders), sponsoring of the community annual Back to School Family Health Fair, providing scholarships for deserving graduating seniors, donating to UNCF and participating in Walk-A-Thons and setting up on-line donations for the American Heart, American Cancer (Relay for Life) American Diabetes and Sickle Cell Disease Associations to assist with research leading to cures for these debilitating and devastating diseases.